true life stories ~ we got to see russell westbrook tie the triple double record and then we met him! Hi. So, I wanted to do a little blog post to document a special night for me and my family. If we’re friends on social media, you probably saw some of the highlights, such as the photo to end all photos, above. 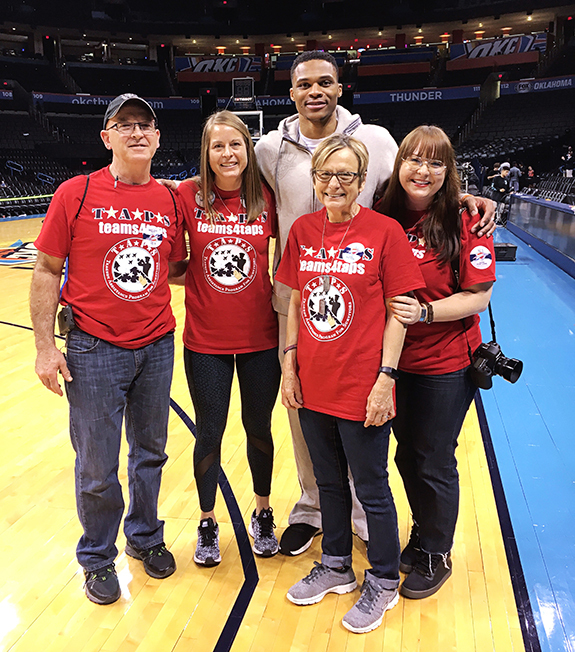 :) But I wanted to share some more details and just express my gratefulness for the kindness we were shown by the Thunder organization and TAPS. Let’s start by chatting about TAPS (Tragedy Assistance Program for Survivors) for a second. I have mentioned this great organization on the blog before, but if you’d like to have a more in-depth look at what they do, you can check out there website here. 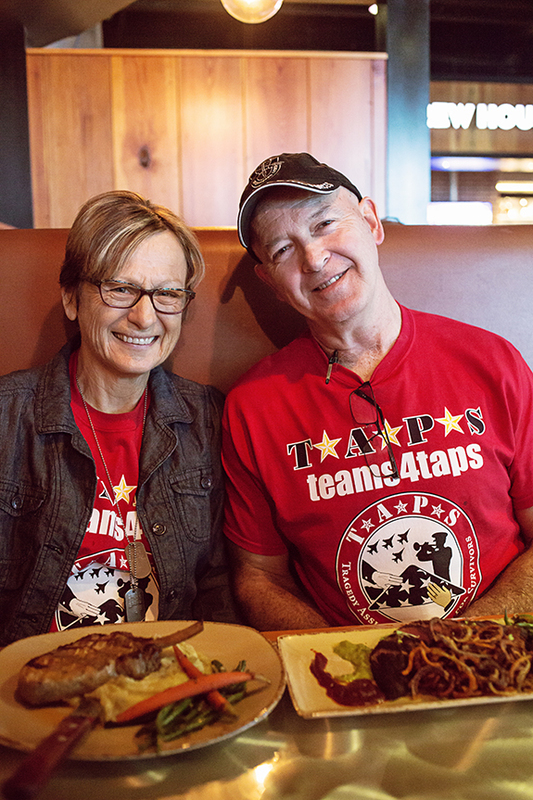 In short, TAPS provides families who have lost a loved one in the military with resources and opportunities for dealing with grief. They not only have seminars and retreats, but they also do cool things like working with a wide variety of teams, organizations, etc, to bring families to fun and cool events. This Thunder game was one of those amazing opportunities. My mom and dad and sister Amber and I had a really wonderful evening! Then the team came out to warm up. Russ did a little pregame dancing. Here’s Joe Sharpe, the head trainer for the Thunder, stretching out Russ. Just a few minutes before this, Joe was up at our seats introducing himself to us. See, Joe is the one who got the Thunder organization involved with TAPS. As he told us, he met some people with TAPS when he was a trainer with the USA Men’s Basketball team for the 2016 Rio Olympics. He said he was touched and impressed by the joy he saw it brought to the survivors he met, and he wanted to help bring that to OKC. Joe was so kind and genuine! In fact, he was the one who introduced us to Russ after the game and took our pic with him. Team introductions are always fun! My personal opinion is that Russ does this with Jerami Grant because Grant is the only one on the team who has hops like Russ. ;) I figured Russ was going to tie the triple double record that night, so I tried to get plenty of cool shots of him. #hist0ry :) These ladies had the most clever signs and they got lots of big screen time for it. Good stuff! Once Russ had made history and the game had turned into a blowout, I had to get some pix of fellow-Iowan Nick Collison, aka Mr. Thunder, aka Hair Jordan. Here’s Nick checking out Doug McDermott’s hair form. And Nick doing what he does. After the game, a good amount of people in the stands lingered to cheer as Russ left the court after doing his post-game interview. Chants of “MVP” rang out, and it was a very neat moment! We LOVE Russ! We were allowed to wait in the stands to see the players who came back out. We got this pic with Joe out on the court, and then we met Russ. The moment of meeting Russ with my parents is one I will never forget. My dad, who has never been phased by anyone he’s ever met, tapped his own heart with his fist and then reached over and tapped Russell’s heart! Russ was cheesing and said thank you and shook his hand. It was awesome and funny and amazing! We congratulated Russ on the incredible triple double feat, and on his baby on the way. His wife Nina was right out there, too, looking all glowy and gorgeous. It was just a very cool moment. And so nice of Joe to bring us out there and let us meet Russ and everything! We were so very touched! HUGE thanks to Joe and the Thunder organization and TAPS!!!!! I would like to get more information on possibly attending a TAPS event with the Cleveland Indians Baseball team. My cousin is one of the 22. I’d just go through the Taps website http://www.taps.org/ and click on the contact button and message them that way! Abi, love your blog. You are a blessing. I’m back with more pix of my pretty sister Mandi, from our fun style shoot we did recently. In my post the other day, I mentioned how I am becoming more and more appreciative of wardrobe staple pieces. The basics. These black jogger sweatpants are exactly those. I don’t even know if they’re really joggers, because the ankle isn’t tight on them. But calling them sweatpants seems rude, because they’re really nice. These are Lauren Ralph Lauren black sweats that are oh-so-soft and oh-so-thrifted for like two dollars! And they looked brand new! So, I wanted to do a couple of outfits for Mandi that were just quick and easy and very comfy, but look pulled together. We started by pairing the pants with this darling icy mint green tee featuring a silver paillate sequin lip print graphic. Amazing. Also from the thrift store. :) This tee has an oversized fit, so I did a quick, messy front side tuck to define the waist a little. The pants are a bit of a loose fit, too, so the half tuck helps it look more styled and not sloppy. Mandi had her super cute thrifted coat on for warmth when we jumped out to take these photos, and I thought it looked great together so I told her to leave it on. I think it works for a couple reasons. One, the colors are fresh and nice together — the green is a cool tone and the yellow warms it up, and the soft colors up top are grounded by the black pants. Two, the lines of the coat work well here. It’s structured and the outfit is not, so there’s a good juxtaposition happening. Plus, the open front of a longer coat like this in a contrasting color provides some nice lengthening lines and kind of frames the cool graphic on the shirt without letting it steal the show. The sweet black loafers we borrowed from my Grams (true story!) help tie everything together, since they are shiny (like the lips on the shirt), have gold accents (echoes the yellow of the coat), and they’re black (like the pants, duh). So, I know I usually share images from portrait sessions or my infamous thrifted style shoots ;), but I also do several shoots a year for corporations, non-profits, and awesome individuals who are ruling the world, like Anna Wickham (pictured above). Anna has used my photography services in the past for some of her speaking engagements and such, but I realized I haven’t ever blogged any of those shoots. One of the coolest things Anna does is this monthly lunch and learn. (Do yourself a favor and click that link to find out more about these fun, informative, free events!) Anna had me come take some photos for her at the March lunch a week and a half ago. Here are some of my favorite shots from it. After everyone mingles (aka networking!) 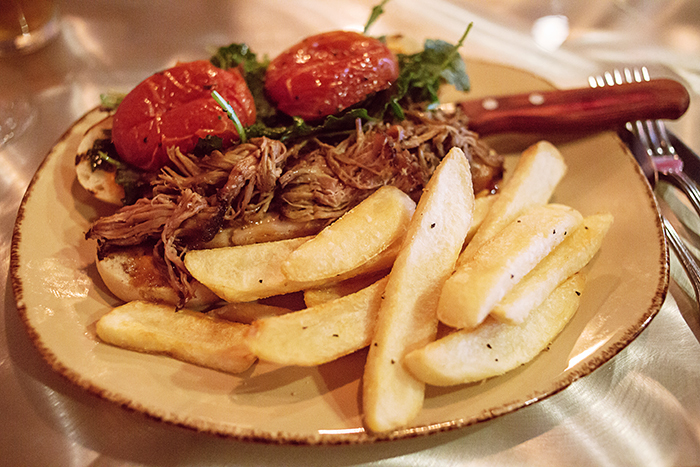 and eats some lunch, Anna gives a topical talk full of super useful information for small business owners. If you’re a professional in need of event photos similar to these I’ve done for Anna, please contact me! I really enjoy doing collabs like these. Thanks for having me out to shoot for you again! I have so enjoyed each time I’ve gotten to hear you speak and freely share your knowledge. I look forward to continuing to work together! Super neat and I love the images from this event. What an awesome space too! You guys. This is one of my very favorite outfits I’ve ever put together. I love these pieces! And Mandi models it so well! Eeek. So cool! So pretty! Love. First of all, we have this amazing top by Corey Lynn Calter for Anthropologie. It’s a whimsical tropical print with the cutest little monkeys you ever did see. :) The colors are soft and springy and gorgeous. And I thrifted it for an unbelievably low price. You guys will not even believe this. It was marked down to 79 cent! But wait. It had a white tag. Those were 50% off. Oh, you think that’s crazy?! Just wait…It still had the brand new $118 tag in it!!!!!! I cannot make this stuff up! I am gonna put the pic of the tags at the bottom just so you guys will believe me. :) But thennnn, aside from that amazing top, we have these jeans. Oh my. I am so obsessed with these. They’re Z. Cavaricci Authentic Hand Crafted Vintage – that’s a direct quote from the tag. :) I love them. Love, love, love! They seriously could not be more on trend. Unless you live under a rock, I’m sure you’ve noticed the huge trend of embellished denim that’s currently sweeping the fashion scene. Right before our shoot, I decided to let out the hems on these. My sweet and sassy Grams was happy to take her seam ripper to these while I was styling Mandi. So this coolness was a group effort. :) I love the result! (Also, Mandi found these rad heels at a thrift store!) Aside from the standout pieces like the top and jeans, it’s so nice to have some great basics on hand to really round out your outfits. This classic open cardigan in a soft neutral can be worn with so many outfits! It used to be easy for me to overlook the basics like this at thrift stores (how can you blame me, with cute monkey faces stealing my attention), but lately I’ve been seeking out higher quality staples to complete my wardrobe. Mandi loved this one I found for her, and I’m sure she will got a ton of wear out of it! Last weekend, I convinced my sis Mandi to pose for me in a little style shoot. When I say “little,” I mean I picked out a million outfits, had her try on a bunch of stuff, did her hair and makeup, we started shooting and ran out of daylight so I asked her nicely to come back at sunrise the next morning to finish… So yeah, not really “little” at all. But super fun! Anyway, this all was inspired by a few things. One, of course I love finding cool pieces at thrift stores to style up and shoot (and sell, eventually). And also, when my nephew DJ graduated from basic training for the Navy last month, Mandi asked if she could wear this gorgeous Badgley Mischka skirt suit she knew I had thrifted awhile back and been hoarding. I thought that it would be perfect, and I set out to find her a top to wear with it. I love the texture of this pretty, dusty mauve pink shirt; and I adore how the long sleeves pool out of the three quarter length sleeves of the jacket. Mandi found the beautiful heels she is wearing here at a thrift store also. I thought she looked incredibly chic at the graduation! And I do have some photos from that day (which I might add later because I haven’t gone through them yet, shame on me), but the graduation was in Chicago and it was freezing and windy! So I wanted to grab a few pics in this outfit last weekend to show it off here. :) Then, a couple weeks ago, Mandi went to the ballet with a friend and was struggling with what to wear. We consulted over the phone several times and she actually ended up wearing the pink top from the outfit above with cream colored trousers. So pretty! But it got me thinking. Mandi has always had good style, in my opinion. Lately she has been a little more unsure of herself when it comes to fashion, because she has entered her early forties and worries about looking age appropriate. Now, here’s where I could say “just wear whatever you want to at whatever age, it’s fine!”…and I do sort of feel that way. But I myself am thirty-six now, and I find myself drawn toward more high quality pieces and different styles and colors than when I was younger. I think it’s a good thing to grow and mature in your style. And then when you are eighty, you can go back to wearing whatever the heck you want, age be damned! haha. Anyway, I do think this is harder when you are dressing for an event, such as the Navy graduation ceremony or the ballet. So, with that in mind, I came up with the outfit below as an option for a classy, cool lady to wear when you need to dress up a little but it’s not necessarily a formal gown occasion. These pants are wicked cool! They have two panels on each leg, over the actual pant leg. The panels are semi sheer and they move and flow in the most gorgeous way. This top is actually the only thing in this post that wasn’t found at a thrift store. But it was still a thrifty find! It’s a Lauren Ralph Lauren top I found at TJ Maxx on deep discount (gotta love those yellow tags!). I believe I paid six or eight dollars for this ninety-eight dollar top. :) I forgot the bag of jewelry when we went to take these photos, but I really think a couple of sparkly bracelets would complete this look beautifully. Luckily, Mandi’s gorgeous smile is enough to accessorize any outfit! Next week, I will share some of the (very, very cool) casual outfits we put together. Love love loved “modeling” for you!! You made me feel like a real model! Love love love you! Love you ladies! Very cute photo shoot. Hope you are both doing well.